This model is our best value in waterers! 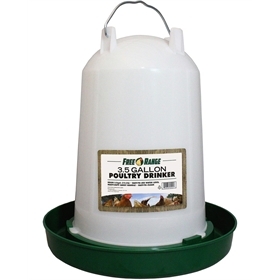 If you are looking for a traditional chicken waterer that's easy to clean, and a great value, this one's for you. Physical dimensions. Make sure the waterer you select will work with your chicken setup -- you obviously don't want to choose something that won't fit through your coop door, for instance! Complete dimensions are listed below. How often you'll need to re-fill the waterer. 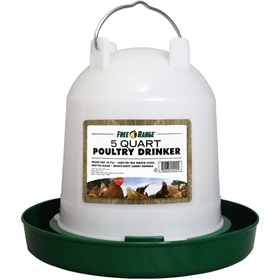 Each adult chicken will drink about one pint of water or more per day (more during especially hot days), so if you have a flock of 10 chickens and you plan on having just one 5 quart waterer, you'll need to refill it about once a day. Adequate access for all birds. 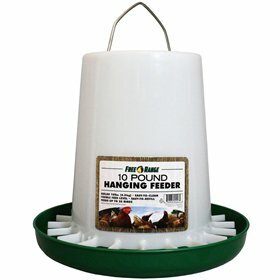 In other words, if you have a large flock but only one, small waterer, there's a possibility that the chickens lowest on the pecking order could literally be bullied into dehydration--so even if you're willing to fill the waterer very often, you may want to get the larger waterer or provide more than one. Also consider the size of your flock. If you're planning to have a mixed flock of both bantams and large fowl (standard) birds, it could be helpful to have your waterers sitting at different heights, so the smaller bantams can drink from the lower-sitting waterer.